There’s no excuse for dull and dreary office buildings anymore, after two spectacular Sydney commercial designs stole the show at New South Wales’ top architecture awards. 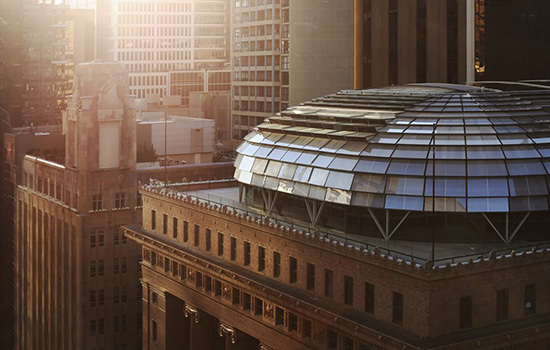 The Macquarie Group building at 50 Martin Place in Sydney’s CBD won the state’s biggest commercial architecture prize after a redevelopment that saw an impressive double-level glass dome placed atop the original 10-storey structure. Macquarie bought the heritage-listed building from CBA in 2012 and redeveloped it with a view to making it more user-friendly and energy efficient. “This project establishes a new benchmark for sustainable design through building reuse, achieving a six-star green star rating,” the jury says in its comments. Architects JPW expanded the building’s central void and added the glass roof, which is certain to become its calling card. 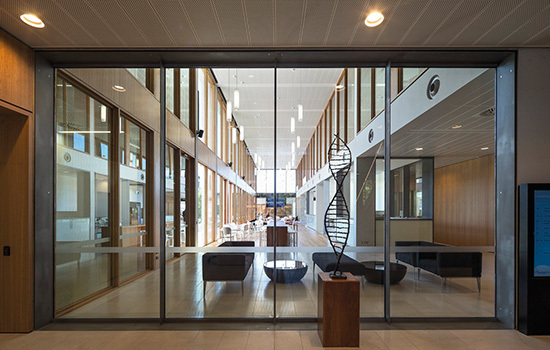 A western Sydney laboratory snared the state’s top overall prize, the Sulman Medal for Public Architecture. The prestigious award was presented to the Westmead Hospital’s research hub, the Westmead Millennium Institute. Designed by BVN, the $110m building in Sydney’s western suburbs was built to unite staff from six sites under the one roof and it won plaudits for its versatility, which would allow it to change and evolve over time. “Generous service zones integrate the huge array of engineering required now and into the future and many of the spaces now set up as offices can become labs as this use expands,” the jury’s comments say.